10-0: the number of times Republicans mentioned God in their platform versus Democrats’ references to the Deity—until Fox News noticed the discrepancy. Which means Republicans are faithful to God, while the Democrats are guided by—Satan, I guess. Republicans, of course, know who God is and exactly what God wants us all to believe: that stewardship of the environment is unrelated to faith, that women lack the moral fiber to make decisions about their own bodies, that homosexuality is a sin. Since Republicans know with certainty what God wants, they’d surely govern according to God’s rules. Therefore, God-fearing people should vote Republican. It’s name dropping, so many references to God, not all that different from my trying to gain your confidence by frequently mentioning my close friendship with Laura Bush or Oprah (neither of whom I, in fact, have ever met). We admire the wealthy. On TV we look enviously at their houses. We want the kinds of cars they drive, the clothes they wear. Trying to be like them we give them power to influence us. We come to believe their words that what’s good for them is also good for us and that they know what’s best for the country. To gain our confidence they rely heavily on name dropping: God this and God that. TV commercials costing PACS millions of dollars affirm our core values, tying God to patriotism and freedom. Wealthy supporters pay consultants big bucks to manipulate us into liking what they want us to like, hating what they want us to hate. We’re against welfare queens though we have no first-hand knowledge of them. Though few cases have been documented, we’re upset about voter fraud and support a candidate favoring rules to make voting more difficult. We don’t pause to ask who really benefits from such positions. Who is harmed? May we not someday wake up to discover we’ve been hoodwinked and that our country has paid a great price. Because we believed them when powerful people said God this and God that. 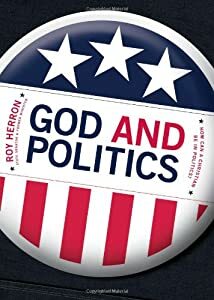 This entry was posted in current events, political, religion and tagged 2012 election, campaign 2012, conventions, Democrat, Democratic, God, politics and religion, religion and politics, Republican by Nancy Werking Poling. Bookmark the permalink. All your emails and notifications produce duplicates to my inbox. I’m wondering why that is…. Sorry about that Dale. It may be explained by my not being tech savvy. I’ll see if there’s anything I can do. If not, please stick with me. I love your design and your politics!!! Great job, Nancy! As a survivor of clergy sexual abuse, I will never again believe anyone who invokes the Lord’s name as part of his/her agenda. I’ve learned the hard way! Yes, because clergy betrayed their trust, many women and men can never again trust a community of faith again. All of us should be wary of those who presume to speak on behalf of God. Thanks for responding. I hope you have found a circle of support as you’ve worked toward healing. You weren’t always proud of me–as in when you were teaching me to drive and I about stripped the gears of your pick-up truck. “Head for that palm tree,” you told me. And I did.